theozfiles: Clancy, of "The Overflow" - Harvard exorcising it's UFO demons? Clancy, of "The Overflow" - Harvard exorcising it's UFO demons? 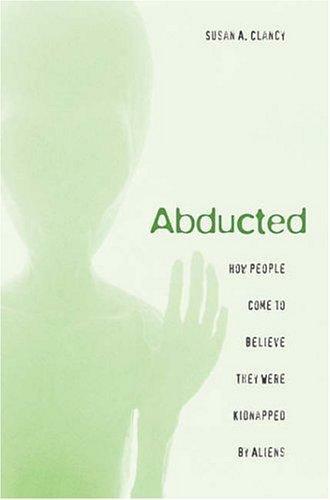 Hearing that Susan Clancy of Harvard has a book - "Abducted: How People Come to believe they were kidnapped by Aliens" - coming out from Harvard University Press due on October 1st, I immediately had floating into my mind "in my wild erratic fancy, visions come to me of Clancy". "for want of better knowledge"
"And an answer came directed in a writing unexpected"
"I can hear the fiendish rattle"
For townsfolk have no time to grow; they have no time to waste." I look forward to reading Susan Clancy's offering, and I hope it is more substantial than work that seems to be driving it. "During 2002 and 2003 research conducted at Harvard University reignited the idea of psychological mechanisms as a possible explanation of alien abduction reports. The key players in the debate were psychologists Susan Clancy and Richard McNally. "False memory creation was examined in people who reported having recovered memories of traumatic events that are unlikely to have occurred: abduction by space aliens," states the abstract of their paper, which was published in the Journal of Abnormal Psychology. The researchers examined false recall and false recognition in three groups: "people reporting recovered memories of alien abduction, people who believe they were abducted by aliens but have no memories, and people who deny having been abducted by aliens." They concluded: "Those reporting recovered and repressed memories of alien abduction were more prone than control participants to exhibit false recall and recognition. The groups did not differ in correct recall or recognition. Hypnotic suggestibility, depressive symptoms, and schizotypic features were significant predictors of false recall and false recognition." This research is interesting but has some severe limitations. The sample sizes used in each group were very small - 11, 9, and 13 respectively. Even more critically, the profile of the "recovered memory" group is flawed. 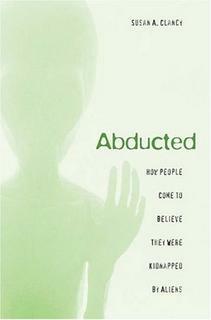 The paper states, "None of the participants interviewed reported continuous memories of alien abduction (i.e., memories of alien abduction that were never forgotten) .... Memories were recovered both in therapy with the help of certain therapeutic techniques (e.g., hypnosis) and spontaneously, after reading books, watching movies, or seeing television shows depicting such episodes." In fact, there are a significant number of people reporting abductions who do not rely on hypnosis and other therapeutic techniques. Their memories are based on clearly recollected incidents for which they have no memory loss or delayed recalled." 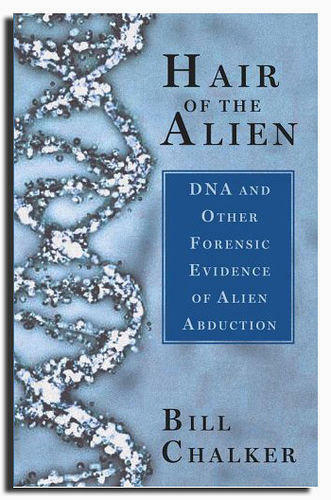 The Peter Khoury alien abduction milieu, which is presented as a detailed case study in my book "HAIR of the ALIEN", represents a potent example of what the Clancy/McNally research fails to address - abduction cases that are clearly and consciously recollected, with compelling physical evidence that appears to support their legitimacy. Susan Clancy's forthcoming book on initial impressions seems to represent an "overflow" of flawed and limited research, albeit interesting, and perhaps spawned from Harvard's attempts to exorcise the UFO and alien demons, unleashed by the late John Mack (another Harvard icon) in his research into alien abductions. Harvard sought to censure John Mack, but instead seem to invoke misguided and failed attempts at martyrdom. Richard McNally sought to anchor a "mainstream" psychological response with his "bedrock" book "Remembering Trauma". Perhaps Susan Clancy is channelling "overflow", or maybe her book will be more substantial than "language uninviting (that) ... comes fitfully and faintly," and more robust than mere "foetid (hot) air" from some imagined "vision splendid." There are suggestions that Susan Clancy's book hints "at a larger ambition, to explain the psychology of transformative experiences, whether supposed abductions, conversions or divine visitations." (Benedict Carey, New York Times, August 9, 2005) She will be walking in a rather large shadow if she embarks into that territory. John Mack was a potent and articulate spokesman for some of the wider dimensions of human experience. With his 1994 book "Abduction - Human Encounters with Aliens", and more particularly his 1999 book "Passport to the Cosmos - Human Transformation and Alien Encounters", he signalled and mapped out his perspectives. In essence "Passport" represented a shamanic envisioning of the whole alien abduction mystery. The transformative aspects of the phenomenon held sway for John Mack, and examination of the physical dimensions seemed secondary or even unimportant. The kind of information I have focused on such as DNA, albeit not without ignoring the shamanic aspects, perhaps conflicted with the numinous dimensions of the hyper reality John Mack speculated may be at the heart of the abduction phenomenon. It seems that in alien abductions John Mack saw affirmations of important concerns and perspectives he had held for some time, and they sat well with the transpersonal and environmental issues he championed for some time, certainly long before the alien sirens beckoned him into their seductive embrace. To do that requires one to disconnect from the classic physical dimensions of the abduction phenomenon, all of which seem to argue that at least part of the experience occurs in the real world and real world consequences occur. Physical evidence, both explicit and hidden, is becoming available. What has not been so much in evidence are appropriate methodologies to capture and assess this range of evidence. So far the record has been uninspiring, but a new paradigm is emerging, one that has been well represented in terms of potential and actual results by one small part of that paradigm, namely DNA. Other parts of that new paradigm have their anchor in science and its broad base of approaches to understanding the world around us, even when it is being intruded upon, perhaps by something out there. Thats the primary focus of my offering - "Hair of the Alien" - a journey through a scientific DNA forensic paradigm. Please take a journey to my call conference setting up blog. Check out my call conference setting up blog, please! I was just doing some hair loss vitamins research and came across your blog. I found it really interesting. Thanks and kind regards. Visualization is a tool that has been used for thousands of years by initiates of all the metaphysical schools. Today, it is incorporated into top athlete's daily routines and is used in business affairs frequently. It's use is wide-spread among highly successful people, either consciously or unconsciously, aware of its create power. So if it has stood the test of time and is still being used by high achievers we must come to the conclusion that it works! But has it ever worked for you? If you answered 'yes' to the above question then you know how powerful this technique can be. If, on the other hand, you gave the more likely answer 'no' then take heart for I am about to reveal to you a sure fire way of reaching your objectives through this mostly misunderstood art. The trouble with visualization is simple - its in its name! When studying and contemplating the art of visualization most people have the impression that they must create visual images and make them real or life-like. Many people, in fact the majority, find this almost impossible to do. Even if they can formulate a solid picture of their objective they find it extremely difficult to sustain the image for any length of time. Either the image fades, changes or other intruding thoughts intervene. This type of visualization is almost impossible to sustain and luckily it is not at all necessary. Why? Because it is in the subconscious mind that your visualization needs to be placed and there is good news. The subconscious mind does not know the difference between an imaginary event and a real one. Your visual image only needs to be a strong visually as any other imagined event. However, that is only half the story. If all you had to do was just imagine stuff and your world automatically changed to reflect your imaginings this world would be full of chaos (not to mention all those creepy crawly bug-eyed monsters!). Therefore, there are a few more steps to complete before the visualization is passed to the subconscious for manifestation. Let's try a little experiment. Remember a scene from your past that has a lot of good feelings around it. Any good memory will do, like the first time you heard the words "I love you" from your partner, an amazingly spectacular sunset, a great holiday event or your last birthday. Pick one and remember it. How clear is the image? Can you remember any sounds? What way did you feel? Is there any sense of touch, taste or smell? Identify how your memory works. Is it mostly visual, auditory, kinaesthetic or of a feeling nature? Now we are going to create an imagined event in our lives that has the same strength and potency as that image. So relax and let's go. Imagine something that you do everyday, something that you did yesterday, today and will do tomorrow. Let us take the example of waking up tomorrow morning. Don't try to add or take anything away, just think about it and analyse the scene. Is it dark or light? Are you lying next to someone in bed? Do you still feel tired? Has the alarm clock sounded? Are you irritable that you have to get up or full of joy at the dawn of a new day? You will find that the imagined event is very similar to the memory with probably one key difference - your point of perspective. Is the memory behind you and the future event in front of you? Is one to the left and one to the right? Maybe they are both in front of you or the future seems to move in a clockwise direction. Whatever the perspective the thing to notice is that they are very similar in appearance. Now imagine doing your future event a week from now, then a month from now, then six months from now. Where are those images placed? Are they moving further away, going clockwise, from left to right? This is your time-line and using it is important in visualization as you will see later. Ok, let's imagine something that is very unlikely to happen and see where it differs from the last image. Imagine you are sitting somewhere familiar which is extremely comfortable and relaxing to you. Now imagine that a person you know well comes up to where you are and says "hello". Imagine them telling you that they want to show you a new trick. All of a sudden they have three juggling balls. They throw them in the air and begin to juggle with ease. Then they begin to whistle one of your favourite tunes. You suddenly realize that there is a strong smell of flowers in the room and notice a vase of them just behind the juggler. Imagine laughing loudly at the scene and feeling joyful at the experience. Then the person juggling leans forward stands on leg and puts the other leg outstretched behind them. All the while still juggling and whistling. Then they begin to hop on their leg as a small bird flies over to perch on their head. Once you have the imagined event and stayed with it a few moments just let it fade. Ok open your eyes. What was the difference between the two images? Can you spot any? Did you use more, less or roughly the same senses in your fantasy event as you did in the future one? Did you see them from different angles? Was the picture bigger in one than the other? Was the sound clearer, the feelings more acute or the smell stronger? Take some time and go back to each scene in your mind. How does the future event differ from the fantasy one? Are you looking at both from a different vantage point? Do you see yourself in the image of one but not the other? Analyse the scenes and see where they differ. Have you identified how the future event differs from the fantasy one? If you have then its time to make visualization work for you! Take a goal that you have been working on or would like to achieve. Nothing too far-fetched at this point please! Pick something that is possible but at the moment seems a little impractical. Once you have it form a mental image of what it would be like to have, be or do that thing or be in that experience. Remember to form it the same way you do a memory. Give it the same strength visually, in sound, feeling, taste and touch - use your mind in its natural state. All you have to do is imagine the scene. Ok how does it differ from the scene of waking in the morning? Can you identify the differences in perspective, sound, taste, touch, feelings and what you hear? Now there will be one other key thing that differs in the images- it is very simple but often overlooked. You know that the future event is going to happen! This is reflected in the way we experience the image. So what we are going to do is fool your subconscious mind into thinking your goal is definitely going to happen by manipulating your goal image! Once you know what the differences are in each image begin to change the goal image so that it is seen the same way as the future event in your imagination. Place the visualized scene in exactly the same position with the same perspective as your future event. Place it in the correct position on your time-line. You may already begin to feel that the goal is more possible. Visualise in this way everyday and you will condition your subconscious mind to manifest the experiences necessary to make your goal attainment certain.